This is such a great recipe and I love how you can even adapt this with other stone fruit such as nectarines and plums. The key is to use fresh fruit because frozen fruit will have too much moisture that will cause the crust to be soggy. It's pretty straightforward of a dessert - a shortbread crust with slices of fresh fruit that's baked. I can only imagine how much more this would taste if you incorporated a custard or cream (cheesecake perhaps?) filling too. But then again, you could always serve this with a healthy dollop of sweetened whipped cream or a nice scoop of ice cream! Preheat the oven to 375 degrees. Grease or butter 8 inch or 9 inch tart pan. In a medium bowl, combine the sugar, baking powder, flour, salt and spices with a whisk. Using your fingers, add the butter and egg to the flour mixture until crumbly. Transfer 3/4 the crumb mixture into the prepared tart pan and pat it firmly onto the bottom and up the sides to create the crust. 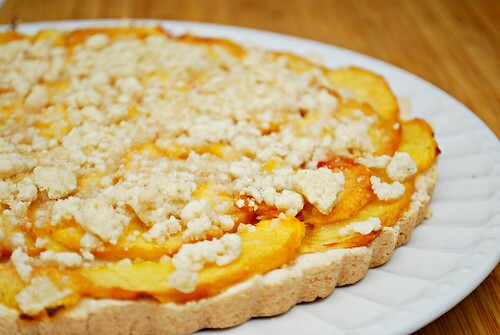 Top the shortbread crust with peach slices in a single layer. Sprinkle the remaining crumbs evenly over the peach slices and bake in the preheated oven for 25-30 minutes or until the top is slightly brown. Cool completely in pan before slicing and serving. Great recipe. Looks fairly simple, might be adding this to things to make this weekend. Thanks! Looks delicious! I've honestly never used peaches in a dish but this inspires me to do so! Gorgeous. We usually have a peaches vs. nectarines war in my house. At least that means there's plenty of both! Oooh, this looks delicious! I've got to go get some peaches. It looks like my dream pie, saying that I love peaches. Yummy! I will try this on weekend, thanks for the recipe!